Looking for a really old fashioned rusty Clark tug connected to the PMDG DC-6 Cloudmaster? If so, then this is your chance! to the DC-6A and/or DC-6B Objects folder. Before you copy and paste anything, make sure you first make a copy of the original pmdg_dcb_tractor.obj file.That’s it! 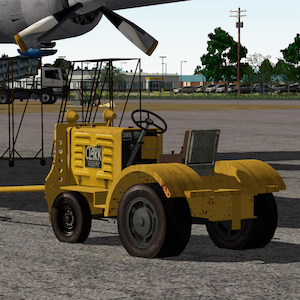 At startup of X-Plane and after selecting the DC-6A and/or DC-6B, you’ve got instead of the stock blue Clark tug Marc’s rusty old fashioned Clark tug. Enjoy!